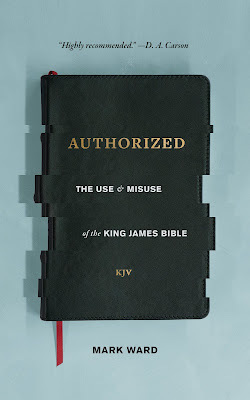 I have uploaded WM 116: Review: Authorized: The Use & Misuse of the King James Bible. In this episode I give an expanded spoken version of my written review of Mark Ward, Authorized: The Use & Misuse of the King James Bible (Lexham Press, 2018): 154 pp. Some might recall my review of an online article by Ward in WM 100: Rejoinder to Mark Ward; Three Ways to Engage Modern Translation Onlyism. In WM 116 I make reference to Ward's June 12, 2018 at the FIFB on The Legitimate Concerns of the Next Generation. For other messages at that 2018 FBFI conference look here. I also note, a new companion video to the book also called Authorized, which you can read about and find a link to here on Ward's blog. Ward's case against contemporary use of the KJV is primarily based on an argument that it is no longer adequately intelligible for modern readers. In conclusion, this critique of the KJV is unusual in that it does not come from a Calvinistic evangelical perspective (like previous popular works by D. A. Carson  and James White ), but from one with a fundamentalist background. This likely reflects an unease by at least some in those circles, like Ward, who do not wish to be stigmatized by their tribe’s use of the KJV or, worse yet, to be given the dreaded label of “KJV-Onlyists.” The question remains, however, as to whether one should abandon use of the KJV merely because some wrongly hold a fetishist view of this translation, or because some who prefer it are falsely labeled as KJV-Onlyist. Ward does not convince this reviewer that the KJV is not “sufficiently readable” and thus inadequate for use as a “main translation.” Few would object that it might be profitable to compare various translations in personal study. It is better still to know the Biblical languages. This does not mean, however, that the KJV has lost its readability and relevancy, or that it must be replaced by those who prefer it. Your point about today being the best of times or day to actually read the KJV due to smart phones and access to the internet and other technological advancements is so good, and so on point. I totally agree with your assessment. Blessings to you! Yes, strangely enough, it has never been easier to explore a difficult term when reading the KJV or any translation. Why then the protest against the KJV? As I suggest in the review, it seems to come more for cultural and apologetic reasons.